BULLETIN: A federal judge in the Central District of California has approved asset freezes and appointed a receiver in a case in which the FTC alleged several companies and a scammer-in-chief were running two mortgage-relief fraud schemes. The scam, the FTC said, traded on an image of President Obama and used at least three .org sites to separate homeowners who already were financially strapped from even more money. Named defendants were Sameer Lakhany of Santa Ana, Calif.; The Credit Shop LLC of Orange, Calif.; Fidelity Legal Services LLC of Orange, Calif.; Titanium Realty Inc. of Anaheim, Calif.; Precision Law Center Inc. of South Coast Metro, Calif.; and Precision Law Center LLC, also of South Coast Metro. Lakhany also controlled three .orgs from which the scam was carried out, the FTC said: FreeFedLoanMod.org, HouseHoldRelief.org and MyHomeSupport.org. As part of the mass-joinder fraud, the scammers charged “$6,000 to $10,000 in advance, but failed to get the results they promised,” the agency alleged. The defendants, according to the FTC, “told consumers these audits would find lender violations 90 percent of the time or more, and that the resulting legal leverage would force their lender to give them a loan modification that would substantially improve their mortgage terms. The defendants falsely portrayed themselves as non-profit, free, accredited, or HUD-certified housing counselors with special qualifications to help obtain mortgage loan modifications and avoid foreclosure. “They promised consumers that the forensic loan audit would be the only charge not covered by their ‘free’ service, and that if the ‘audit’ did not turn up any violations, consumers could get a 70 percent refund and still obtain a loan modification. They also told consumers their loan modification requests would be seriously delayed without the audit,” the FTC charged. The scams traded in part on an image of President Obama, the FTC said. One ad featuring an Obama image urged consumers to call a toll-free number to “Speak With a Counselor and Receive a FREE Loan Modification Under the Obama Loan Modification Programs,” the FTC said. Using various misrepresentations, the scammers targeting vulnerable Americans took in more than $1 million, the FTC said. The addresses of Credit Shop LLC and Fidelity Legal Services LLC were mail drops, the FTC said. 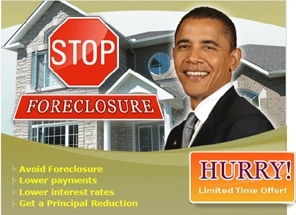 Tags: Fidelity Legal Services LLC, foreclosure rescue schemes, FreeFedLoanMod.org, FTC, HouseHoldRelief.org, mass-joinder lawsuits, mortgage relief scams, MyHomeSupport.org, Precision Law Center Inc., Precision Law Center LLC, President Obama, Sameer Lakhany, The Credit Shop LLC, Titanium Realty Inc. These are the lowest form of crooks, taking advantage of people already in peril of losing their home by selling them fake mortgage reductions. It seems they have no bottom in how low they are willing to go to line their own pockets, much like many corporations. That’s what’s wrong with America, plain old greed. Don: These are the lowest form of crooks, taking advantage of people already in peril of losing their home by selling them fake mortgage reductions. There’s a lot to be liked about the “beating of people on the bottom of their feet with sharp sticks” form of punishment being introduced for criminals like these.